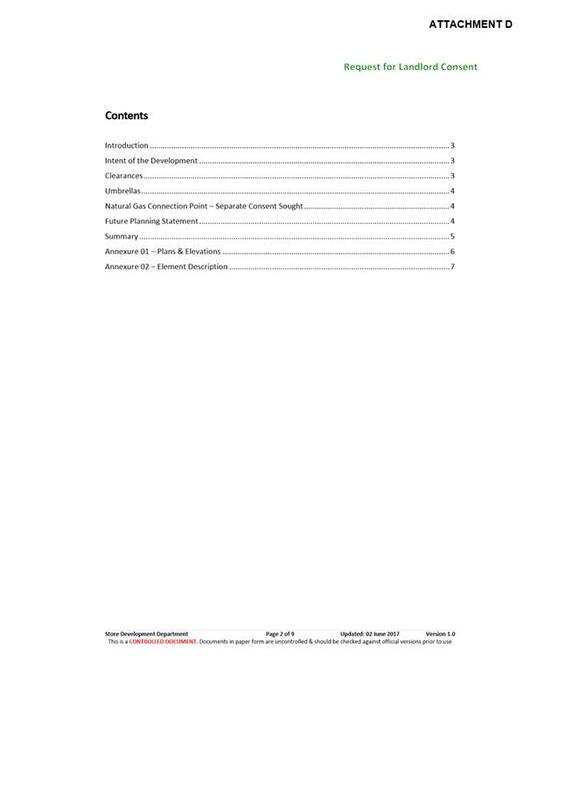 Special City Infrastructure Committee Meeting (Open Portion) held Monday, 24 July 2017 at 4.35 pm in the Lady Osborne Room, Town Hall. Aldermen are requested to indicate where they may have any pecuniary or conflict of interest in respect to any matter appearing on the agenda, or any supplementary item to the agenda, which the committee has resolved to deal with. 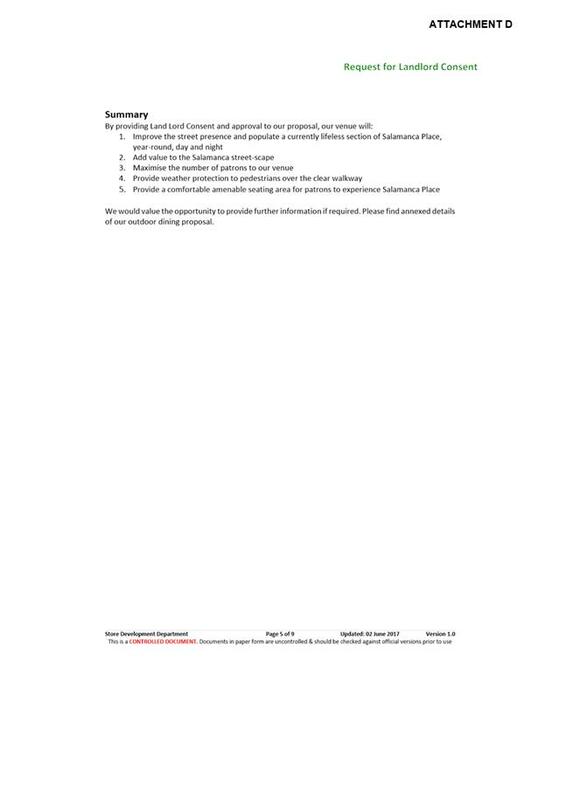 Memorandum of the Director City Infrastructure of 21 July 2017 and attachment. 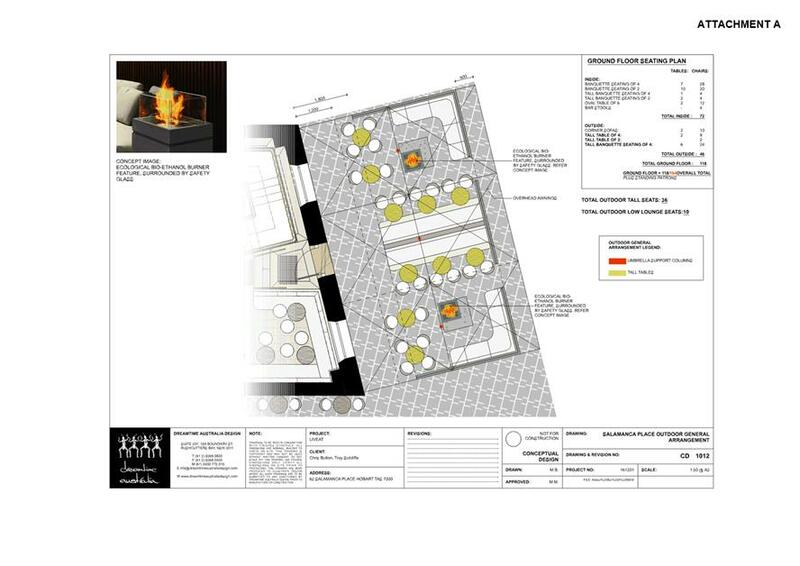 This memorandum provides additional information concerning requests for the installation of outdoor dining and umbrella infrastructure of the footpath at 61 and 63 Salamanca Place. 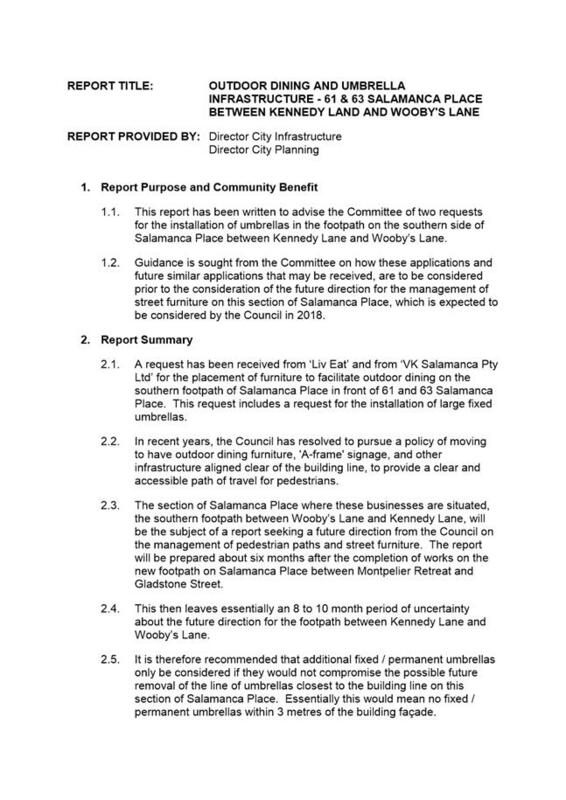 A report was provided to the 21 June 2017 meeting of the City Infrastructure Committee on requests from ‘Liv Eat’ and ‘VK Salamanca Pty Ltd’ to install permanent umbrellas on the footpaths outside 61 and 63 Salamanca Place (refer Attachment A). 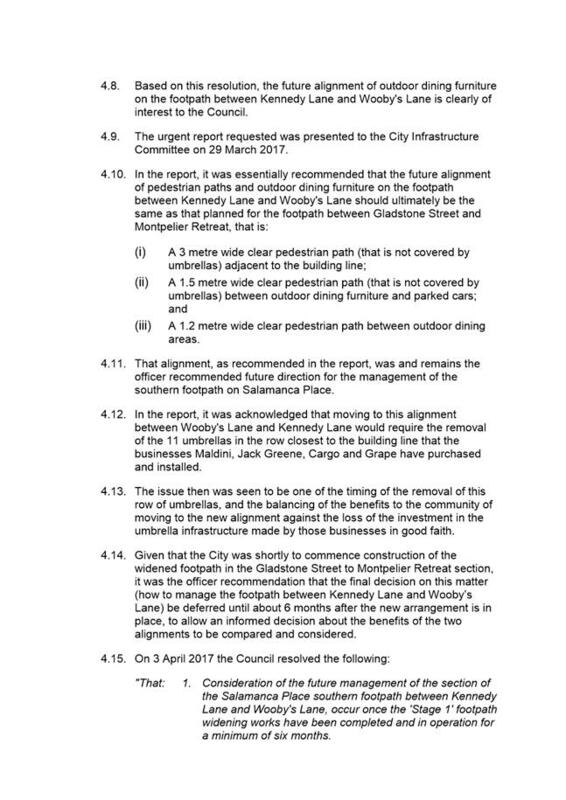 The purpose of that report was to obtain clarification from the City Infrastructure Committee on behalf of the Council as highway authority, as to whether fixed / permanent umbrellas would be supported in this area prior to the future management of this footpath being determined in 2018. 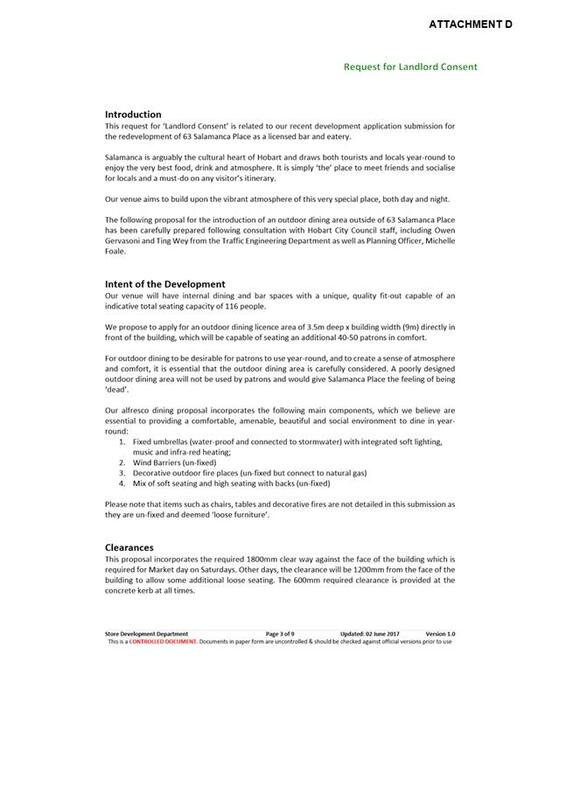 The matter was referred to 3 July 2017 Council meeting, whereat the Council resolved to refer the matter back to Committee for further consideration. The application if for two rows of fixed umbrella canopies, supported by a single row of central poles. 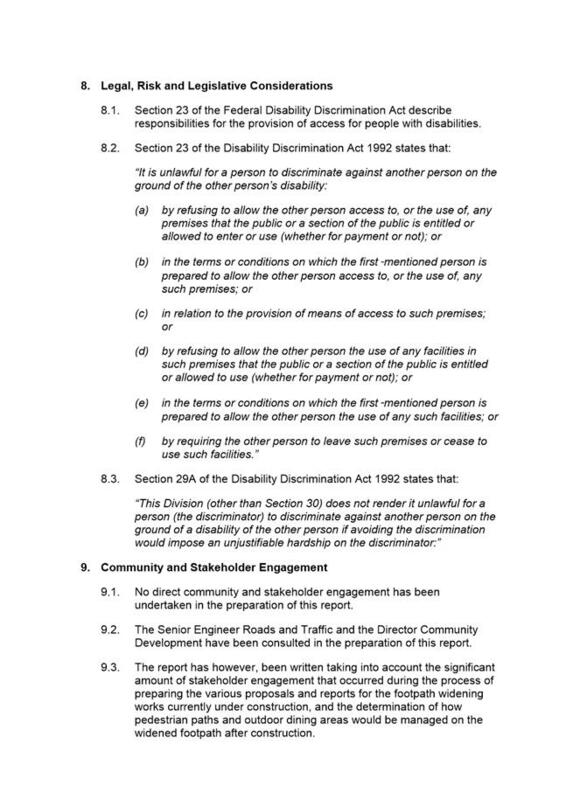 The extract below from the documents submitted by Liv Eat show the general arrangement. 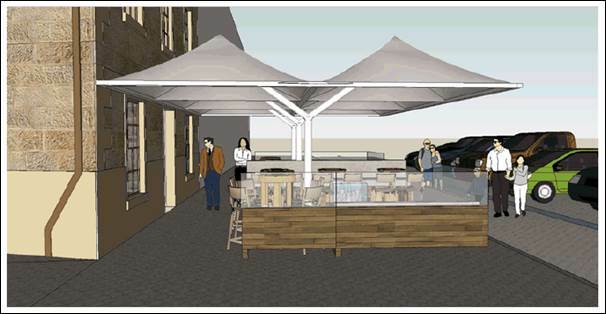 The umbrella canopy’s would match the existing arrangements in this section of Salamanca Place (shown in the figure below), but the pole would be on a different alignment. Under the most recent Committee resolution, officers would consider that given Liv Eat can remove the row of canopies closest to the building line, this proposal would be supported. Officers would work with the applicant to ensure the application was varied as appropriate to ensure that it is satisfactory in terms of Salamanca Market operations. 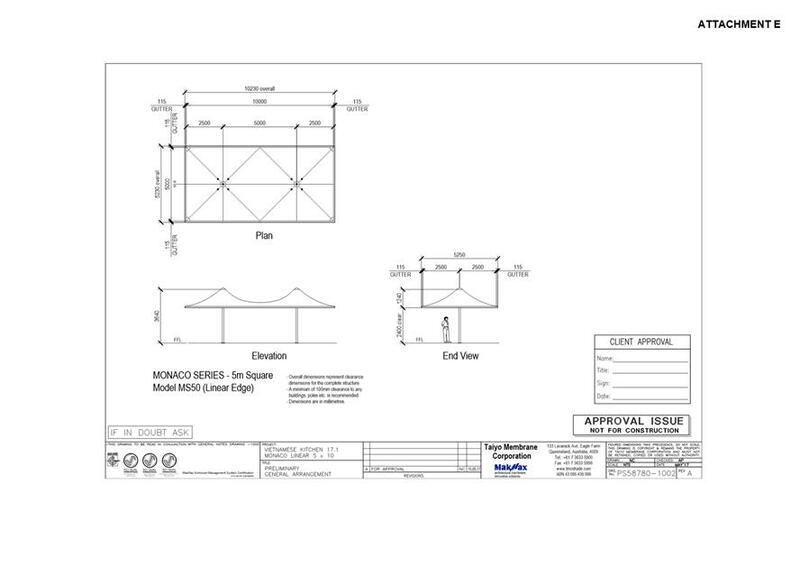 The application is for a single row of fixed umbrella canopies, supported by a single row of central poles. 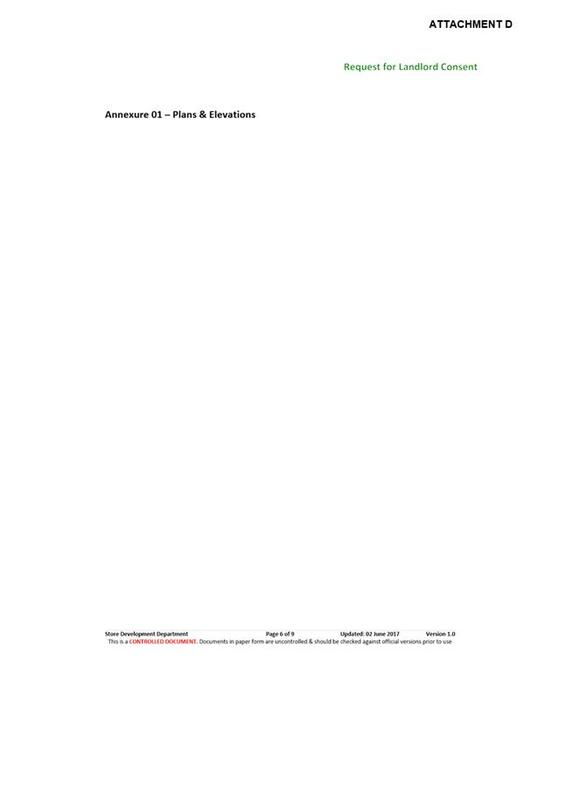 The extract below from the documents submitted by VK Salamanca show the general arrangement. 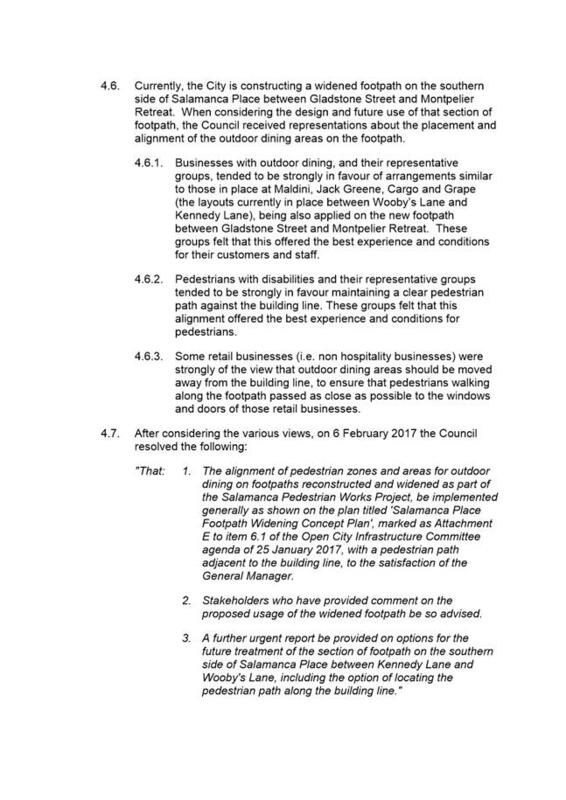 Under the most recent Committee resolution, officers would consider that this application could not be supported, as the large single canopy covering the full width of the footpath could not be easily removed. 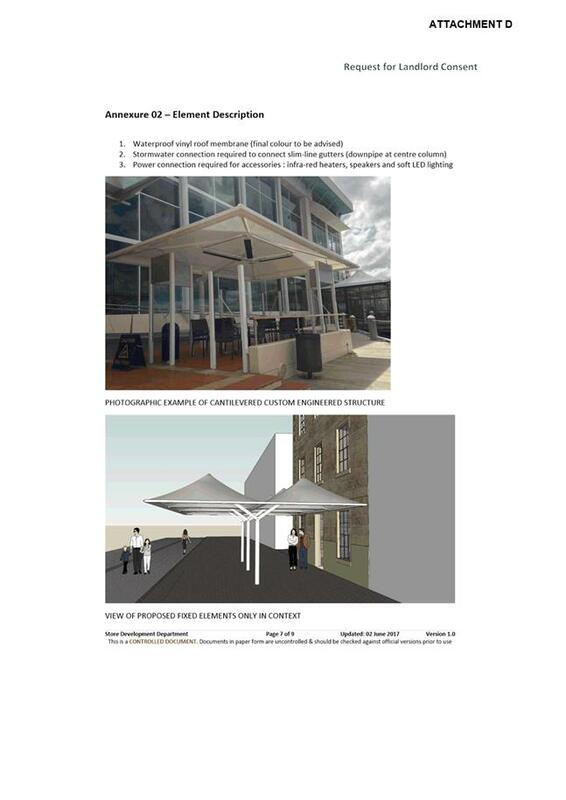 If this is the intent of the Committee, Officers would suggest to the applicant that they modify the application to include the two rows of canopies (rather than the single row) as per the Liv Eat proposal. 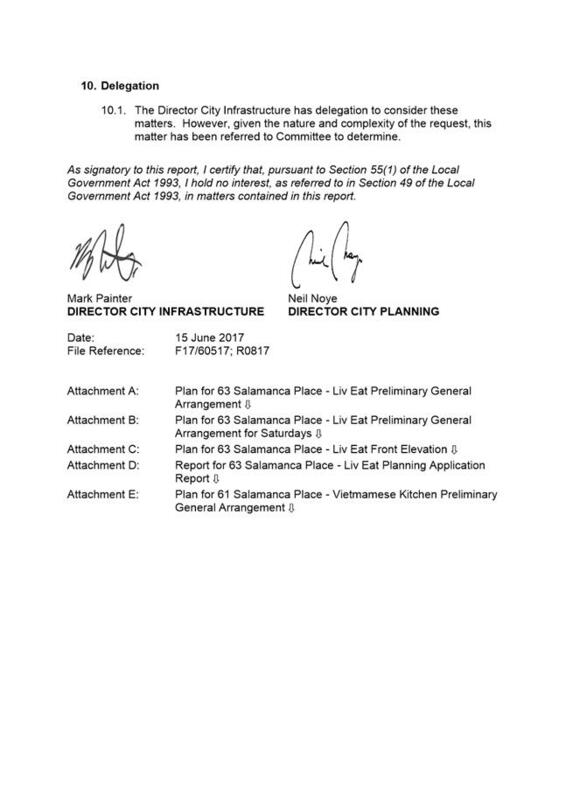 At the Council meeting held on 3 July 2017 however, it was suggested that the intent of the Committee’s recommendation to Council, as contained on page 1 of this memorandum, was that both applications (61 and 63 Salamanca Place) be approved by the Council subject to the applicants agreeing to remove the umbrellas at their cost should the Council resolve to create a walkway along the building line. 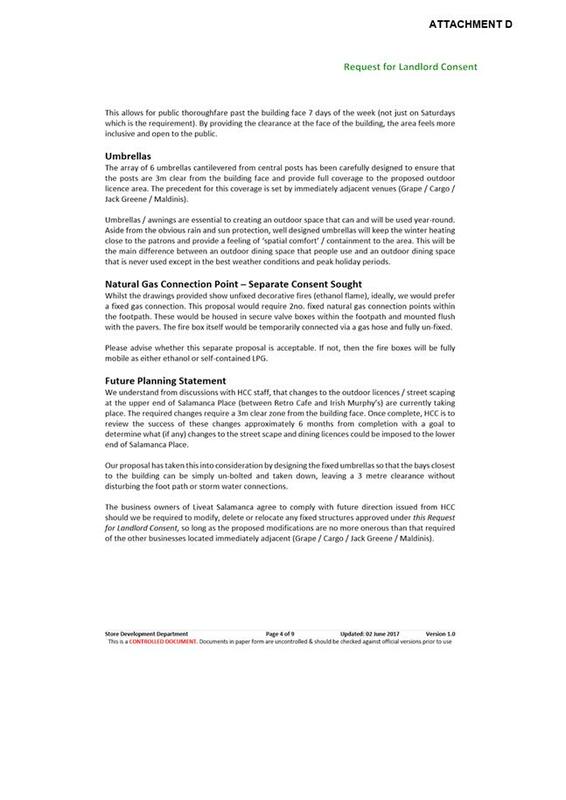 Officers are of the view that ultimately there are three main options to consider in relation to permanent/fixed umbrellas and infrastructure along Salamanca Place (between Montpelier Retreat and the Silos) and they are listed below. 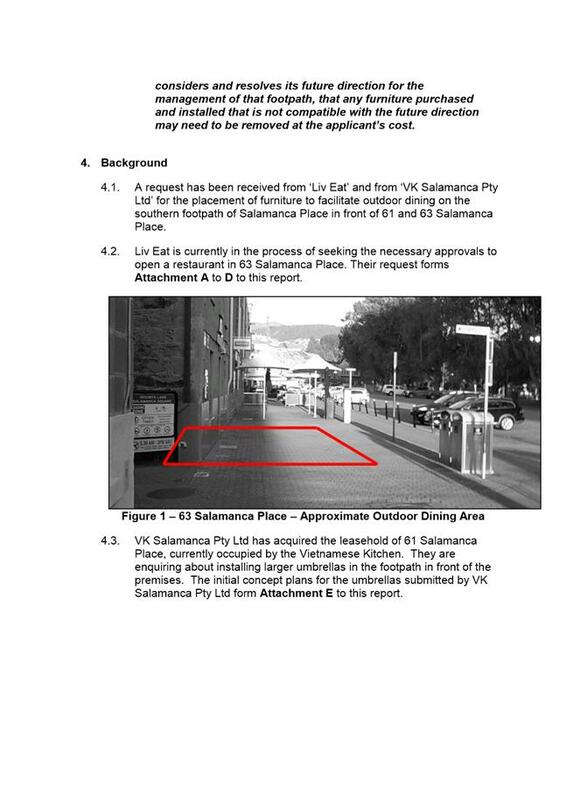 · Do not permit the installation of any additional fixed / permanent infrastructure until such time as the Council resolves the future direction for the ongoing management of street furniture on the Salamanca Place footpath in 2017.
o Under this option, businesses would be granted licences for outdoor dining, but would not be able to install fixed / permanent umbrellas until Council resolves its future direction. o This option does not support the applications from Liv Eat or VK Salamanca for fixed furniture. 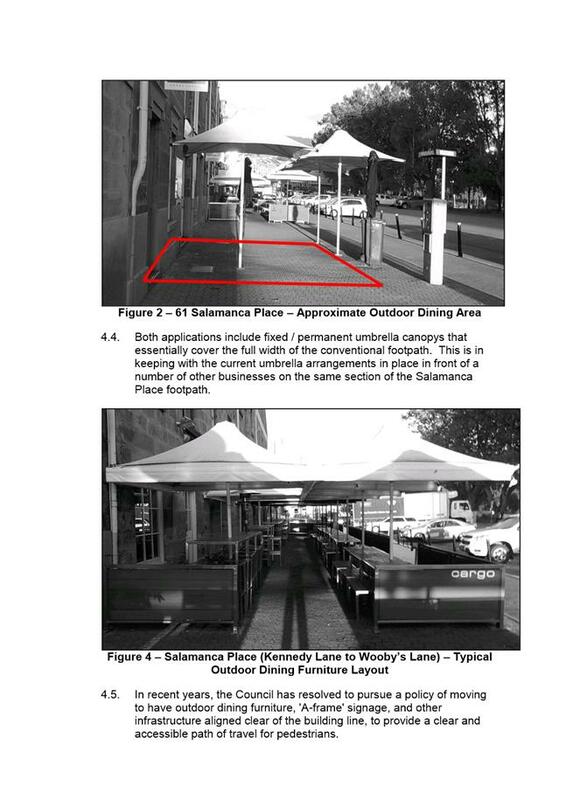 · Allow businesses to install additional fixed / permanent infrastructure (provided any necessary planning approvals are obtained, and provided the installations do not obstruct Salamanca Market operations or obstruct the flow of pedestrians), on the clear understanding that the businesses risk being required to remove and replace the umbrellas with something that complies with the Council’s future direction, and that any such removal / replacement would be at the businesses own cost. 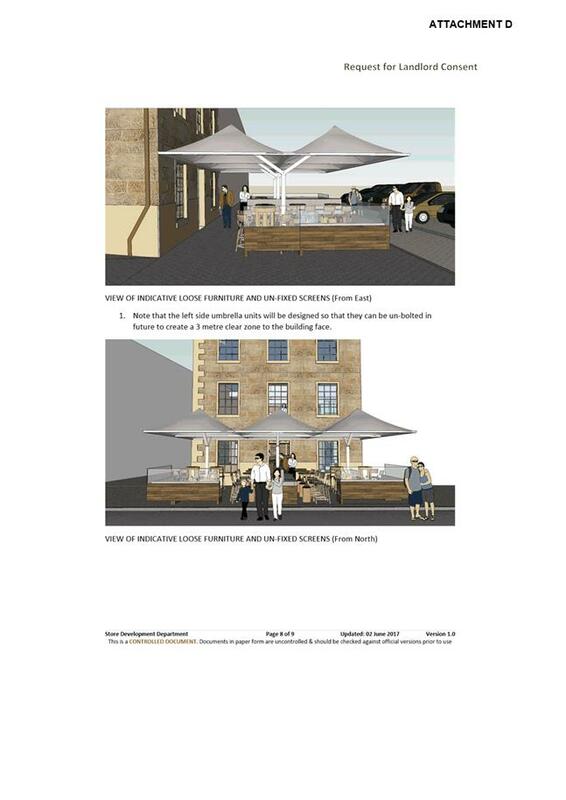 o Under this option, businesses would be granted licences for outdoor dining, and would be able to install fixed / permanent umbrellas (assuming they obtained a planning approval if required), but would do so on the clear understanding that they may be required to remove these umbrellas in the short to medium term. 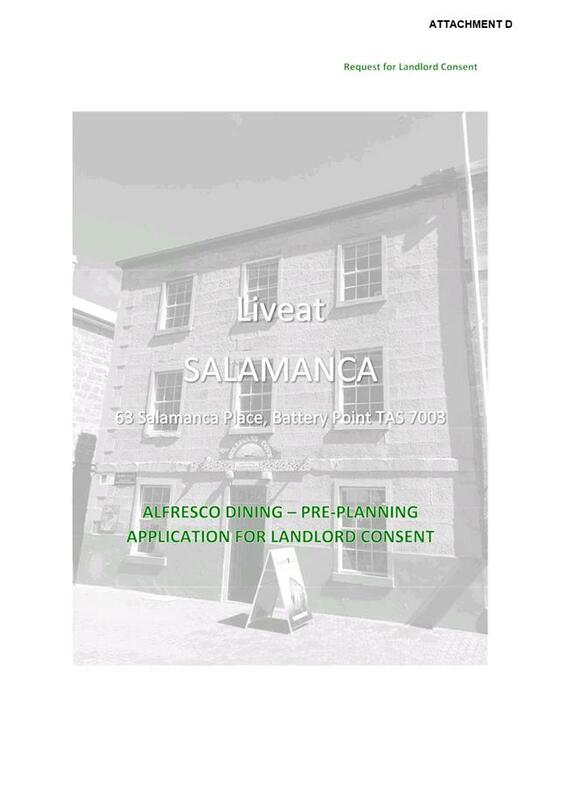 o This option supports both applications from Liv Eat and VK Salamanca for fixed furniture. 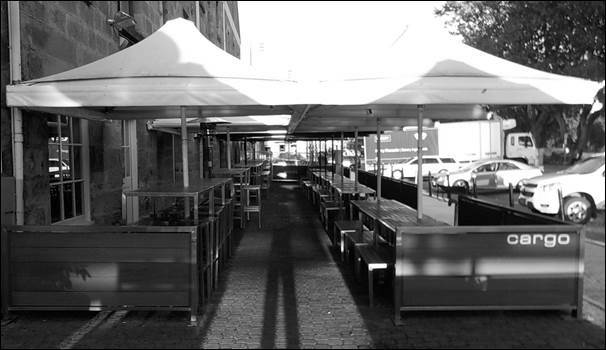 · Allow businesses to only install additional fixed / permanent infrastructure (provided any necessary planning approvals are obtained, and provided the installations do not obstruct Salamanca Market operations or obstruct the flow of pedestrians), if that additional fixed / permanent infrastructure would be compatible with the currently preferred future alignment for pedestrian paths and outdoor dining furniture. 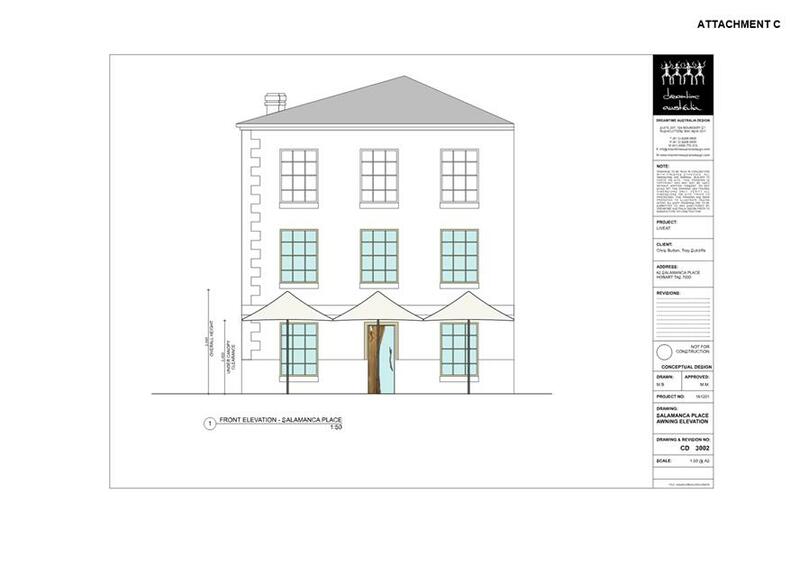 o Under this option, businesses would be granted licences for outdoor dining, and would be able to install fixed / permanent umbrellas (assuming they obtained a planning approval if required) only if those umbrellas matched the row of existing umbrellas located 3m clear of the building line at the other venues on this section of Salamanca Place. 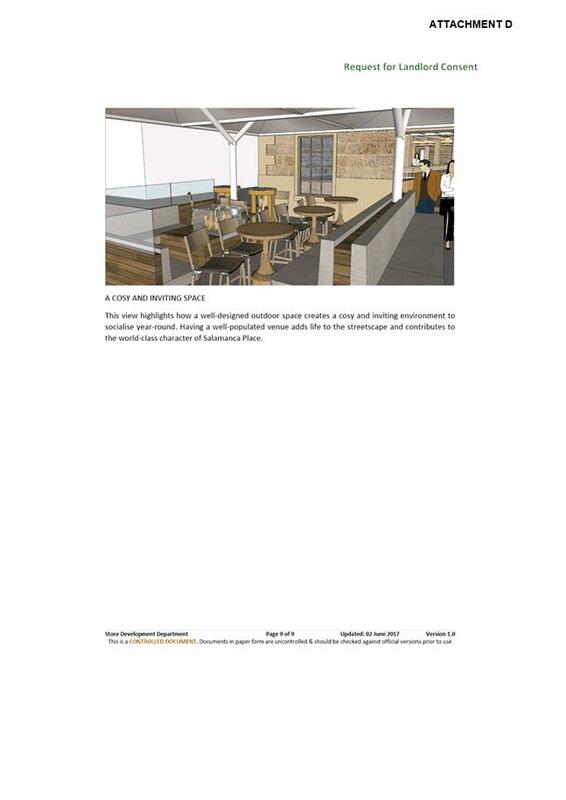 o This option supports the application from Liv Eat for fixed furniture. 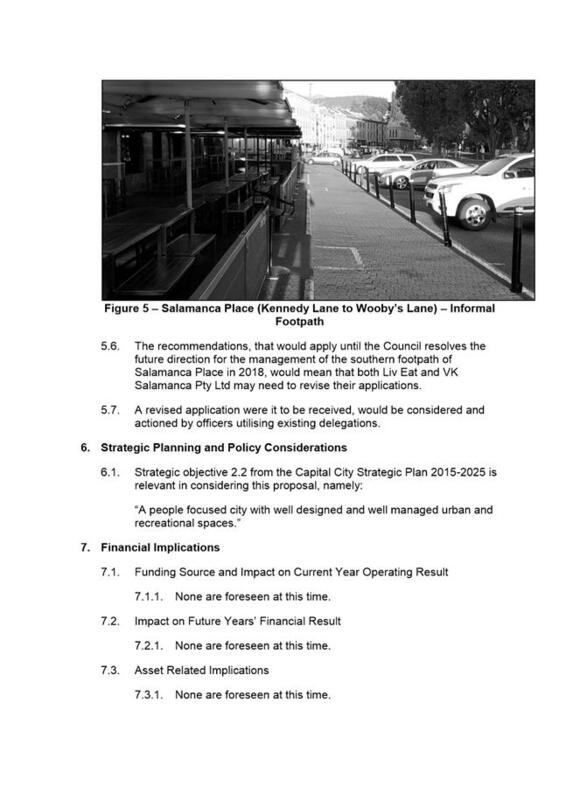 VK Salamanca would be required to amend its application to a similar format to what is proposed from Liv Eat. 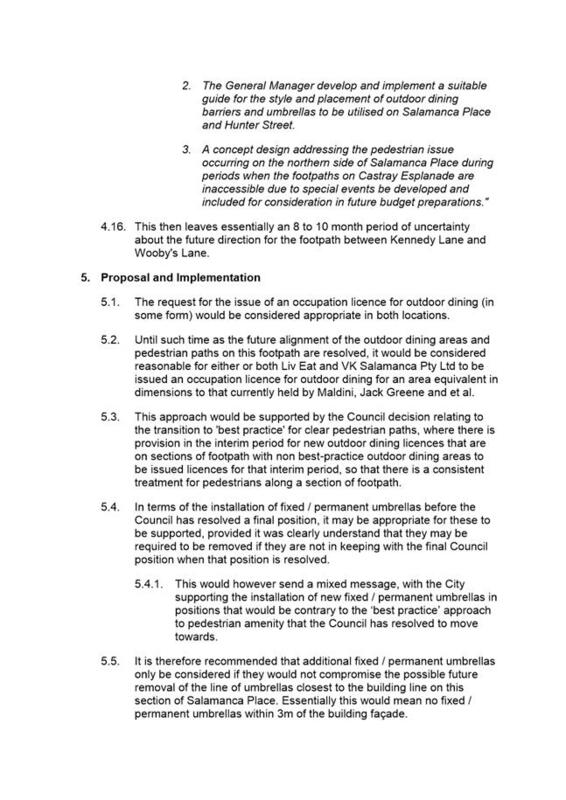 No additional fixed/permanent infrastructure be permitted on the Salamanca Place footpath (between Montpelier Retreat and the Silos) until such time as the Council determines it policy position in relation to fixed/permanent outdoor dining and umbrella infrastructure. 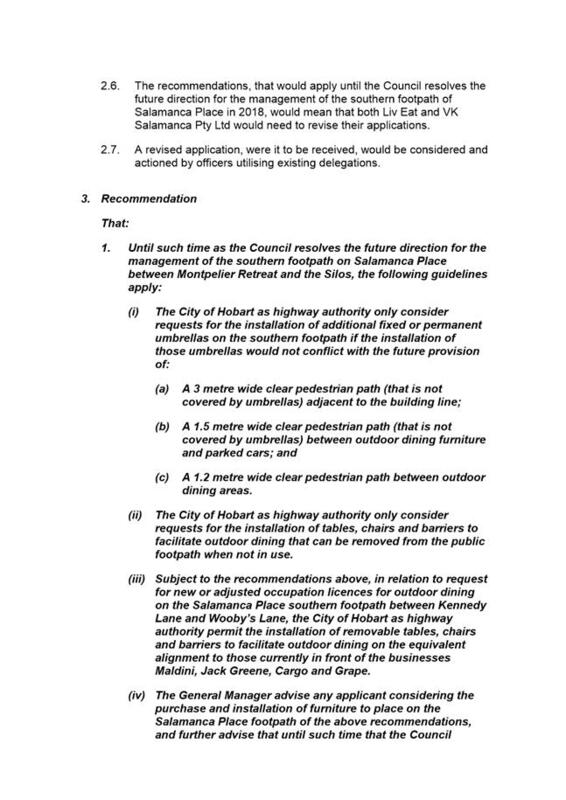 (i) The City of Hobart as highway authority permit the installation of additional fixed or permanent umbrellas on the southern footpath.